Enthusiasm is contagious. Have you ever walked into a room and there is this one person that is just so enthusiastic and positive! About life, so spontaneous and bubbly that you feel you just want to spend the whole day in their company? 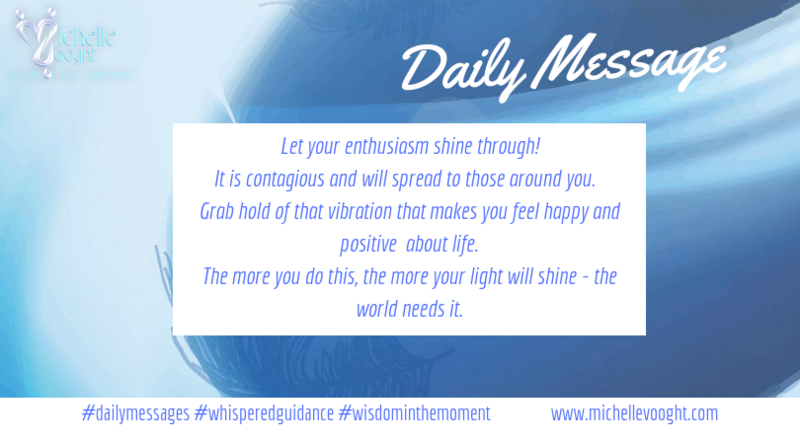 It is true that enthusiasm shines through, it is not something you can hide or hold back, it just flows! When you are doing what you love, and you feel you have lost your mojo, why not say “I am so blessed to be working with what I love right now”…let your enthusiasm shine through, feel the quivering anticipation of life! Yes, we may be scared sometimes, yes, we may be unsure, but it doesn’t mean we cannot be enthusiastic about our journey! Make a list of the positives today, grab hold of that vibration that makes you feel happy and positive about life…it will spread to others. The more we do this, the more our light will shine – the world needs it. This little light of mine, I’m going to let it shine….